ECS has quietly published brief specifications of its new miniature LIVA Z personal computer, which indicates that the system is set to hit the market in the coming weeks or months. The new small form-factor PC is based on Intel’s Apollo Lake system-on-chip and thus features improved general purpose performance, graphics, and multimedia playback. The ECS LIVA Z comes in a small 117×128×33 black enclosure, which is a bit larger than the Apple TV STB and about the same size as Intel’s entry-level NUCs. 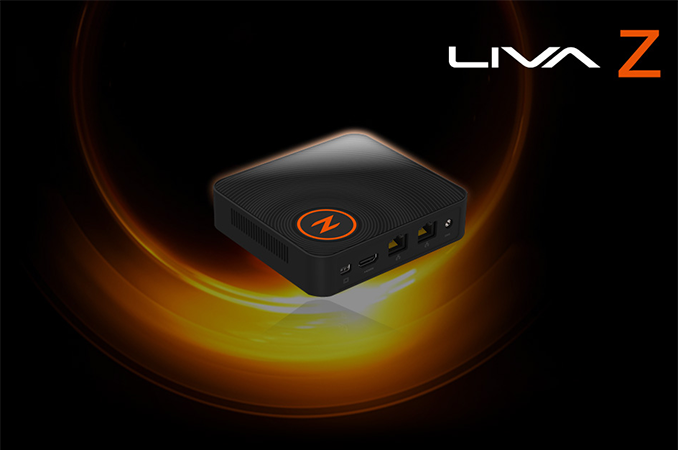 While the LIVA Z has rather advanced media playback capabilities and has both HDMI and mDP outputs (as well as a TRRS connector for analog audio), ECS positions its new SFF system not as a media-centric PC, but rather as an affordable miniature computer. This is a reason why the LIVA Z does not come with a remote control or even an IR receiver, but has two GbE ports in addition to 802.11ac Wi-Fi and Bluetooth 4.0. For peripherals, the system has three USB 3.0 Type-A ports as well as a USB 3.0 Type-C port. The heart of the ECS LIVA Z is an Apollo Lake SoC, which brand and model numbers the manufacturer does not disclose, but FanlessTech claims that the chip is a desktop part with 10 W TDP. Anyway, we do know that Intel’s Apollo Lake chips feature up to four x86 cores based on the latest low-power Goldmont microarchitecture, a new graphics core that features Intel’s ninth-generation architecture (Gen9) with 12 or 18 EUs as well as a new multimedia playback engine that supports hardware-accelerated playback of 4K video from hardware decoding of HEVC and VP9 codecs. The architectural and multimedia-related enhancements of the Apollo Lake SoCs make the LIVA Z quite good for light multimedia and video playback workloads. So far, ECS has published only brief specs of the LIVA Z on its website, but we understand that the system will exist in different configurations, (possibly different regions will get different variants). The SFF PC will feature up to 8 GB of DDR3L memory (up to two SO-DIMMs), a pre-installed eMMC 32 GB/64 module as well as an M.2-2242 slot for SATA SSDs. There is no place for 2.5” HDDs/SSDs inside the LIVA Z, hence the system supports only solid-state M.2 storage devices. Currently the maximum capacity of available M.2-2242 SATA SSDs is 512 GB (albeit, they are rare), which means that people with vast multimedia libraries will have to use external storage. At present ECS does not disclose pricing of its LIVA Z nettops and does not reveal when and where the PCs are set to be available. Prices will naturally depend on exact SoC, RAM, eMMC configuration as well as on the version of Windows included (or the lack of any OS). Some of the previous-gen ECS LIVA systems started at $170 and $180, so expect the new versions to be in the same range. Many thanks to FanlessTech for the original source. pfSense router or other homebrew network appliance.